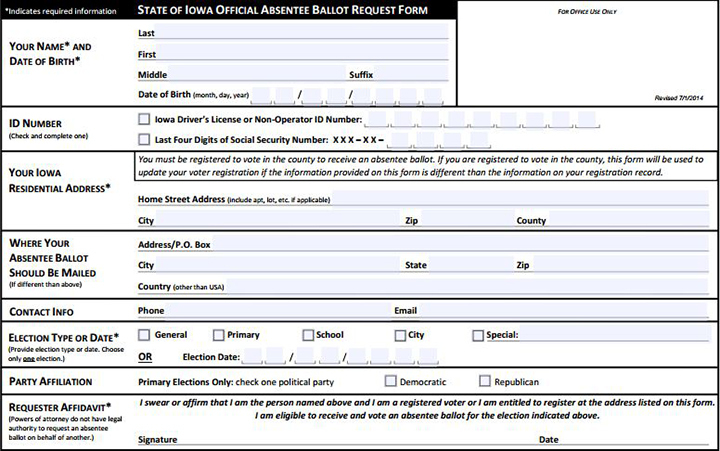 Filling out this form once could lead to a perpetual flow of absentee ballots, if a bill offered last week in the Iowa House is approved. 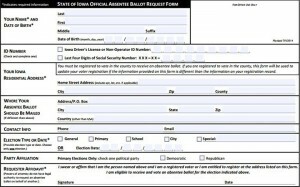 State Rep. Bruce Hunter offered a bill last week that could result in “perpetual absentee voting” in Iowa. Earlier, The Iowa Statesman reported on efforts in the Iowa General Assembly to tinker with the state’s election laws. Those efforts continue with Hunter’s newest piece of proposed legislation. House File 48, if passed, would allow an absentee voter to receive absentee ballots for all subsequent general elections without having to re-apply before each election. It would allow the automatic absentee voting to stop at the voter’s request, when his or her County Auditor determines he or she is no longer eligible to vote absentee, or if the voter does not vote in two consecutive elections. Florida has a similar law on the books, and Illinois allows for voters to sign up for up to five years at a time. In both states, absentee voter fraud has been a widespread problem; HF 48 doesn’t provide for any new methods for preventing fraud or abuse. The Iowa State Association of Counties and the League of Women Voters of Iowa have both declared they are undecided on the bill. AFSCME Iowa Council 61 lobbyists have declared their support for the proposed legislation.